Fall is a time of transitions; leaves begin to change colors, the hot summer days turn into crisp autumn nights and we begin to shed the foliage of what no longer serves us so that it may be composted over the winter, becoming the rich fertile soil of our lives the following spring. The thing I love about the Ayurvedic tradition is that it honors these seasonal transitions, both externally and on a more internal and emotional level. 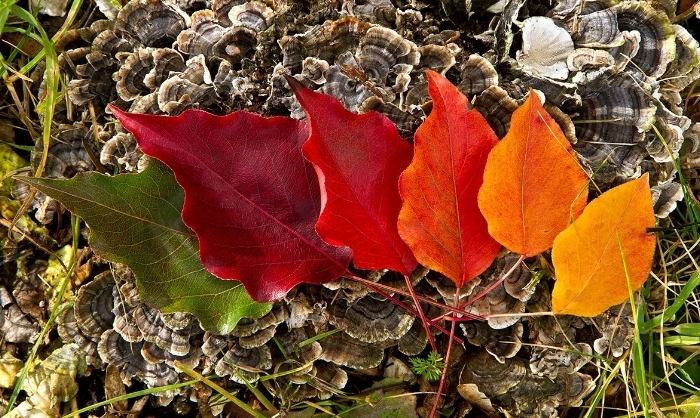 By noticing the inherent qualities of fall, we can begin to understand that the opposite will bring us into balance. In the late fall, our systems continue to run on the heat energy accumulated during the summer season. As the weather chills and the cold winds arrive at our doors, we begin to sip our favorite teas, pull out our favorite sweaters and gather around the hearth, warming our bones. As this transition occurs we will likely begin to experience more dryness and lightness in our bodies. The cold temperature also affects our circulatory systems by slowing down our circulation and increasing the chances of blockages from undigested food residue. these are also the qualities shared by the Vata dosha. By witnessing the qualities of our external environment, we begin to shed light on how to balance our inner environment and our own internal Vata doshas. In order to balance Vata we need warming, grounding and nourishing remedies. We need routine, self-care practices that ground us, to rise early to take advantage of the sunlight, and to use mindfulness practices to bring us into our inner stillness. In order to counter the cold in Autumn + Winter, our bodies need work work harder to produce more heat in order to maintain our normal body temperatures. During this time the fire in the stomach goes up, and that is one of the reasons we need to fuel our bodies with heavier, grounding foods that are full of proteins and good quality fats. Quality Fats + Proteins are nourishing, grounding and building which support our bodies in the colder months. If our circulation is poor, the increase digestive fire can get trapped in the stomach and not be properly dispersed through the rest of the body. This trapped heat dries us up from the inside and the wind dries us on the outside - this is one reason you may find yourself dealing with dry & flaky skin during the cooler months. Eat vibrant, cooked foods that are heavy, moist and oily with warm, and soft qualities. The sweet, sour and salty tastes are balancing to our systems throughout this season. 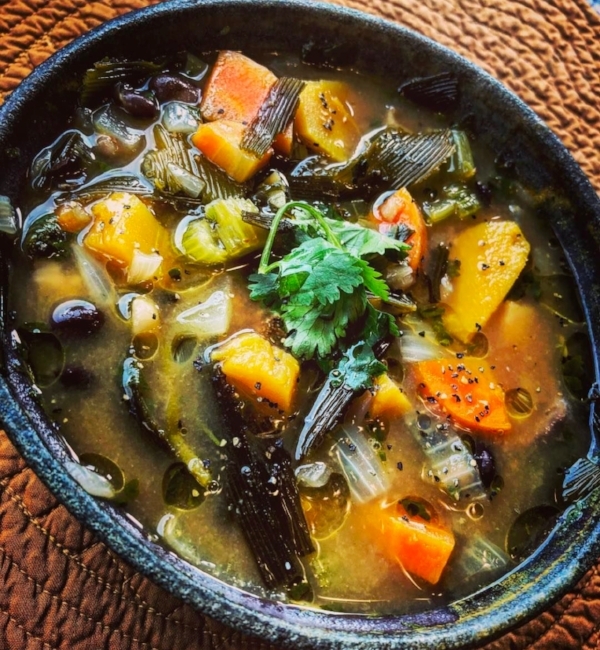 Supportive Autumn foods are broths, soups, strews, good quality dairy, whole grains, lots of good quality fats such as olive oil, avocados and ghee. Check out my blog post on medicinal broths here for some recipe inspiration! Eat foods that are cooked or served warm. These warming foods will go a long way to preserve your inner moisture as well as keep you grounded through the Vata season. Eat a bit more food, but no more than you can digest easily. More food provides more heat for the body in cold weather. Winter is building season, and taking extra care of your health at this time will ensure overall good health for the rest of the year! Stay Hydrated! By drinking enough water we can help to maintain our bodies moisture throughout these dry months. Ideally we are drinking 1/2 our body weight in ounces per day! By adding unprocessed ocean salts such as Atlantic grey or Celtic grey to our water (electrolytes!) we can help our kidneys to absorb all of the water we are drinking. Start with 1/2 tsp and adjust from there. You want the water to taste salty, but not too salty to drink. Repeat often! Incorporate warming spices and herbs to increase circulation and support Agni, our healthy digestive fire. Supportive spices include ginger, garlic, cardamom, cinnamon, nutmeg, cumin, cayenne pepper, turmeric, curry blends, mustard seeds, black pepper, paprika, rosemary, oregano, saffron, celery salt as well as unprocessed salts. Establish a daily routine. One of the best ways to support vata is by establishing a daily routine. Try and do things at the same time such as wake up, excessive, eat your meals and go to bed. By getting up early and being with the silence of the quiet morning we can set the tone for the rest of our day. Ground, nourish your system by rubbing sesame oil into your skin, warming Abhyanga massage. This daily practice helps to coat and protect the nervous system, grounds us and helps bring tone and vigor to the tissues. Follow this practice by a warm, relaxing shower. Do not use soap, instead allowing the oil to continue to sink into the skin throughout the day. Gentile yoga and mindfulness/ meditation practice. These practices can help us to ground into our bodies, calm our nervous systems and balance our Vata within. Exercise in the morning or the evening. Vata can be aggravated by fast moving and intensive movements so consider more gentle forms of exercise such as walks, hiking, biking and yoga. Fall is a time of slowing down, and moving inward. A time for deep reflection, for internal growth, for composting that which no longer serves. I invite you to allow for this slowness in your life. Looking at the places where you can use your empowered NO as a form of self-care and self preservation. Looking at where you can add in extra time for writing, walking in the woods, drinking a warm cup of tea and being in harmony with the slowness of this beautiful season transition. There is so much richness here, in terms of the inner growth. Although our minds and bodies are still buzzing from the outward energy of the summer season, allowing the space for stillness can truly support our internal landscape and our health and we move into the cooler months. Living in sync with the natural rhythms of the seasons, our bodies and our emotions can have profound effects on our overall well being. By paying attention to the natural world around us, we gain insight as to how we can best care for our inner world, and support our mind, bodies and spirit. Ayurveda provides a beautiful framework for working with the natural rhythms of the world around us, to bring us into a deeper experience of balance and harmony. in a small saucepan, heat the ghee over medium/low heat. Add the cardamom pods and cinnamon stick, and toast for about 1 minute or until the spices release their aroma and darken a shade. Add the saffron, and oats, stirring well, and toast for another 1-2 minutes allowing the flakes to absorb the ghee. turn off the heat and remove the cardamom pods and cinnamon stick. Top with hemp + pumpkin seeds. For an extra treat, melt 1 more tbs of ghee and mix in cinnamon powder and drizzle on top. Drain and rinse the adzuki beans. Place them in a medium/ large pot. Add the water (or broth) shiitakes, and kombu seaweed and bring to a boil over high heat. Cover the pot, reduce heat to low and simmer for 30-35 minutes until the beans are soft and tender inside. Remove from heat and set aside. You can compost the kombu at this point, as well as let the shiitakes cool and slice them, returning them to the pot. Warm the sesame oil in another large pot over medium heat; add onions & ginger and saute for 3 minutes or until fragrant and translucent. Stir in carrots and squash and cook for a minute more. Add the adzuki beans and their cooking liquid, bringing the pot to a boil over high heat. Cover, reduce heat to low and simmer for 10 minutes or until the vegetables are cooked. Stir in the kale and wakame and simmer for 1 minute more. Add the miso to a strainer and place over the pot so the bottom sits in the soup to dissolve. A note here, you will want the soup to cool for a bit before this step, if you add the miso when the broth is too hot you will kill all of the living enzymes in the miso. Heat the ghee in a dutch oven or an oven proof saute pan over medium- low heat. Add the cardamom, cloves, cinnamon and toast for 10 seconds, then add coriander, and cashews and cook for 2-3 minutes until the cashews brown slightly. Add the salt, carrots, rutabaga, beet, daikon, and celery root. Increase the heath to medium-high and stir-fry for 3-4 minutes to sloightly brown the vegetables. Pour in the broth to cover the vegetables by half and bring to a full boil. Add the bay leaves and cover the pan with a tight fitting lid and transfer to the oven. Braise the vegetables for 40-60 minutes, until they are very tender. Remove and discard the cinnamon stick, cardamom pods, bay leaves. Garnish with the fresh herbs and serve hot. You can use a slow cooker to braise the vegetables, in which case you would cook on low heat for 6-8 hours overnight. One of my favorite ways to incorporate all of these herbal remedies into my daily ritual in the Autumn + Winter season is to make this delicious chai! I keep a weekly batch steeping on the top of my wood stove! It saves energy, keeps at a perfect simmer decocting my herbs low and slow for a long time making sure to get the most out of them and not to mention it’s such a lovely ritual to tend to the fire and my chai at the same time! If you do not have a wood stove, a crock pot or the stove top will work too! I hope this leaves you with some new perspective and inspiration for self-care as we move into these cooler months, looking towards the intelligence of nature as a model for tending to our own inner ecosystems.